Code reuse makes coding simpler and more efficient in program development. 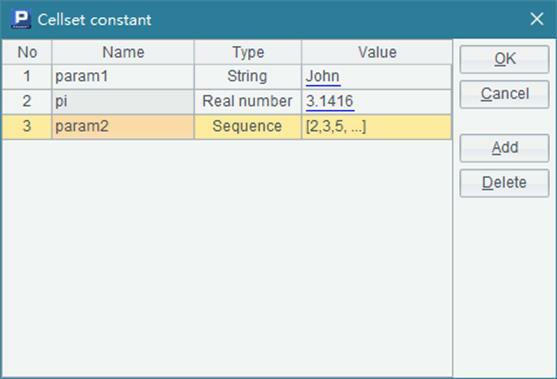 esProc supports basic code reuse by loop, as well as the modular programming through subroutine call or cross-cellset call. Here we discuss how to implement the two types of calls. According to the two blocks of code, a subroutine can be called from any cell of the cellset. Actually during the running of a cellset program, the code block of the subroutine won’t be executed until the subroutine is called. The subroutine which uses A5 as the master cell gets a product name and a client name according to the parameters. B6 returns them as a sequence. When it calls the subroutine, B8 creates randomly a product number and a client number and passes them as the parameters to the subroutine. If multiple parameters are used in calling a subroutine, they will be entered to cells from left to right starting from the master cell. A2’s subroutine is the same as the one in the previous example. A5’s subroutine doesn’t have the return statement, so it will not return a value and will only add a record to A1’s table sequence with each execution. That’s why B10 can start with > when it calls A5’s subroutine. And the subroutine call will stop at the end of A5’s code block. Here A1’s subroutine doesn’t have a return statement, so it returns the value of the last calculation cell beginning with = in its sphere, i.e. B3’s cell value, instead of the value of constant cell C3. This equals using return id in B3. In this case A4’s result is still the 5 random strings each composed of 2 letters, and B4 still gets 10 random strings composed of 3~5 characters each. In the cellset, B2 adds characters to A2 circularly to create random IDs and returns them using return statement. Similar to a subroutine call, it is also not necessary to use the return statement for a cross-cellset call. The returned result will be the value of the last calculation cell starting with =. You can change A3’s code to =A2, for example, and still get the same result. Notice that B2 uses a cellset parameter, size, which needs to be set in Program parameter dialog on the menu bar. In the above configuration, whichever directory in the main path or search path the dfx file is placed, it can be called by the call function by name, without the necessity of writing the whole path. By reusing the existing cellset program, the cross-cellset call makes the code in the main cellset more concise. In addition, an algorithm which needs to be encrypted can be put into a separate cellset for being called by another program.